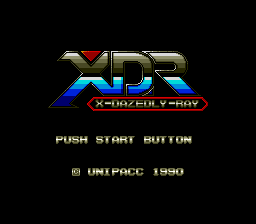 XDR (エックス・ディー・アール), short for "X-Dazedly-Ray", is a 1990 shoot-'em-up by UNIPACC released for the Sega Mega Drive exclusively in Japan. The warlord Guardia was banished from the planet Sephiroth, otherwise known to be a very peaceful planet. Many years later, he returns, complete with an entire army which overpowers the Guardian army, leaving one hope: the newly developed XDR craft.